Check out the new trailer for The Crazy World of Arthur Brown, released October 26th 2018, celebrating the 50th Anniversary of this landmark record! Back in summer 1968, THE CRAZY WORLD OF ARTHUR BROWN were on top of the world. Famously promoted by performances with Arthur Brown wearing a burning helmet, ‘Fire!’ was a massive worldwide hit, topping the charts in the UK and Canada and eventually reaching the Top 10 in America (No. 2), France, Germany, Austria, The Netherlands and Ireland. The band’s second single on Track Records, co-produced by The Who’s Pete Townshend, it bridged the gap between London’s flourishing, colourful psychedelic underground and the mainstream pop scene. The resulting album, THE CRAZY WORLD OF ARTHUR BROWN, was a theatrical, ambitious concept album based around the elements (fire being just one of four, of course). Such was the huge impact of ‘Fire’ that the album sold in huge quantities, peaking at No. 2 in the UK and No. 7 in America. The Beatles were the only other British band to enjoy such unprecedented sales with such ambitious, psychedelic LPs. Millions of people discovered the delights of ARTHUR BROWN, rock’s supreme showman, and his influence would be felt the following decade when ALICE COOPER acknowledged his debt to Arthur’s genius. 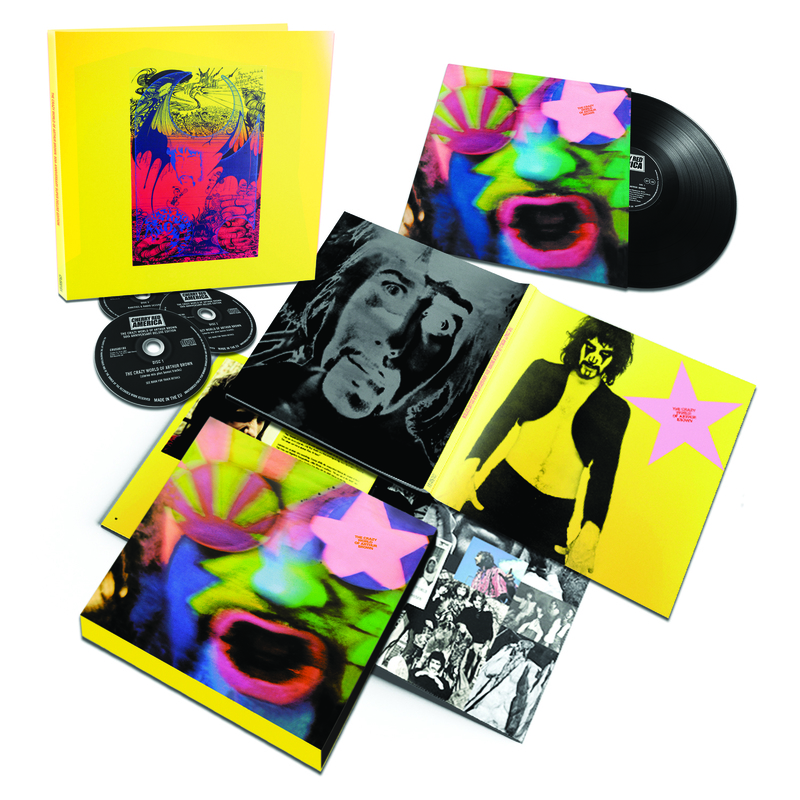 Lavishly packaged within a 12” x 12” box set, and complete with a stereo vinyl replica of the original LP and a poster, THE CRAZY WORLD OF ARTHUR BROWN is augmented by a 12,000- word sleeve-note from Mojo magazine’s Mark Paytress (including fresh quotes from Arthur and others), alongside a wealth of illustrations and three previously unissued photos from the original front cover session. Arthur will be promoting this landmark reissue with a raft of promotion – and watch this space for news of an exciting anniversary show!